The Hungry Earth/Cold Blood feels more like classic Doctor Who than anything seen before in the new series, tapping into how everyone remembers the Pertwee era to be, and virtually every reviewer has pointed this out. But no one seems to appreciate the equally distinctive Colin Baker feel, with protracted torture scenes and luminescent underground sets; I must confess that Vengeance on Varos was more on my mind than Pertwee’s encounter with the Silurians, who this time around look more human than reptilian when their masks come off. This is a compliment, mind you, since I like more about Colin Baker than most, and less about Pertwee than many. If that sounds ambiguous, rest assured this is a good story in a season that, amazingly, hasn’t yet produced a single dud. The minimalist setting is a welcome reprieve from the usual noise, involving only four characters besides the Doctor, Amy, and Rory. Our heroes step out onto the Welsh countryside in the year 2020, where they find blue grass, an isolated drilling project, and become fast involved in strange occurrences. Corpses have been disappearing from undisturbed graves, and it doesn’t take long to catch on that the body snatching is coming from below the earth. We aren’t fully exposed to the underground threat until Cold Blood, which allows The Hungry Earth to breathe and unfold like a Sherlock Holmes mystery, and I’m hard pressed to say which half is more impressive: the first for its haunting graveyard site, or the second for the alien underworld. As in the Pertwee classic, the story takes a tired cliché and turns it on its head. The alien invaders aren’t really aliens but “Earthlians” who have as much claim to the planet as humanity. Having evolved on Earth millions of years ago, these homo reptilians had reached the point of advanced civilization before a (supposed) apocalyptic catastrophe drove them to seek shelter underground, waiting in suspended animation for the disaster to blow over. This time it is a drilling project that awakens them from their slumber, and they retaliate by abducting the drillers in preparation for war. 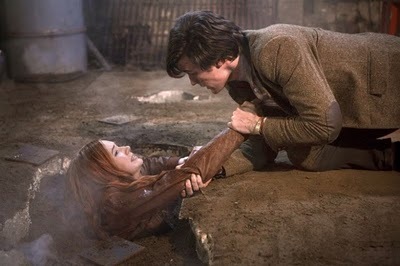 They manage to snag Amy, despite the Doctor’s furious attempt to keep her from being pulled underground, and before she knows it she’s on the dissection table. But it’s when the Doctor is later screaming and writhing in agony under decontaminaton that we really feel the ghost of Colin Baker. The new series hasn’t gone to places like this — save in Dalek when the Ninth Doctor got tortured by Henry Van Staten — and it’s ironically fitting that such disturbing treatment occurs at the hands of “aliens” who are most like humanity. 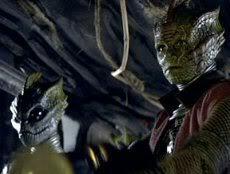 And even for the good: The Silurians are complex in their politics, certainly not all warmongers, and enough of them want peace that the Doctor is able to engineer a negotiations session for terms of coexistence. 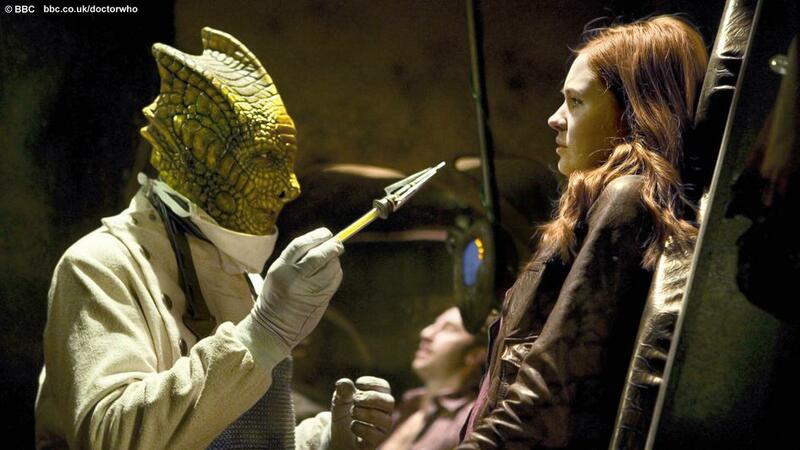 The bargaining table is of course doomed from the start — abruptly dissolved when it is explained that the Silurian hostage has been killed — but fascinating for what it reveals about the Doctor’s political compass. In contrast to Vampires of Venice, where he refused to allow even one city to save an entire species, and in most cases where his conscience must carry the weight of aliens he destroys on humanity’s behalf, here he bends over backwards to put Silurians on the same playing field with homo sapiens. “From their point of view, you’re the invaders,” he lectures the drillers in exasperation, and he’s obviously right. The underground realm is wonderfully realized with its luminescent reds and greens, and by this point in the season I feel like I’ve fallen completely down the rabbit hole. The abundance of “Alice” cues haven’t exactly been subtle, but in The Hungry Earth/Cold Blood we go literally down. Moffat has put a lot of thought and planning into his fairy tale, and the entire season is shaping up to be a work of art. It’s also worth mentioning that we’ve gone through 70% of it without a single bad episode. Usually by this point in a Davies season I’ve dished out a few 1- and 2-star ratings, but this year, so far, remains free of lemons. “Neo-Gnosticism [is] a modern revival greatly encouraged by the discovery at Nag Hammadi. In co-opting these ancient sources, the neo-Gnostics are unlike their ancient counterparts. They want to embrace the earth, while Gnostics often shunned the earth; they don’t wish to be elitist, although many Gnostics claimed to be a class apart from humanity at large. Above all, neo-Gnostics want to insist on the gender-equality of women with men. Those are aims I happen to agree with, but you need to cherry-pick Gnostic sources and ignore a great deal of what they say to make that picture work as an account of the Nag Hammadi library. Chilton covers dualistic (wisdom as an hysterical divinity) and non-dualistic (wisdom as divine personification attainable by believers) versions of ancient gnosticism, as well as radical revisionist (villains like Cain and the serpent turned into heroes, Jesus laughing from Gologotha, etc.) and neo-Platonic versions, any of which can intersect with the others. Point being to remind ourselves that ancient gnosticism was as complex as orthodoxy. Doctor-lite stories have a curious track record. Love and Monsters remains the most divisive story of the new series, Blink the most popular, and Turn Left the triumphant last gasp of the Davies era before a bad finale brought it to its knees. Amy’s Choice isn’t Doctor-lite, but it may as well be, strutting with the same determination to ignore the rules and throw something bizarre at us, only this time with the Doctor getting his usual screen time. It’s by far the weirdest story of the new series, and in a good way, as if David Lynch had been commissioned to write under the name of Simon Nye. Needless to say, if Lynchian dreamscapes don’t work for you, neither will Amy’s Choice, and judging from nasty reviews circling the web at the moment, that seems to be the case for many Doctor Who fans. I adore Amy’s Choice. I’m confident that posterity will judge it a classic. 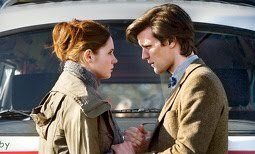 The story finds the Doctor, Amy, and Rory flicking back and forth between two scenarios, one of which is a dream they are sharing, the other reality. They are told, by a mysterious figure called the Dream Lord, that to die in the dream will cause them to wake up in reality for good. To die in the real scenario will cause them to, well, really die. One takes place inside the TARDIS which has gone dark and freezing as it hurtles towards a cold sun. The other takes place five years later in the village of Ledworth, with Rory and Amy happily married and pregnant; the Doctor is visiting them, and they are confronted by a group of zombie-like elderly people who can barely walk but are hell-bent on murder. Our three heroes must agree which scenario is the dream, and allow themselves to be killed in it, in order to escape the Dream Lord’s puzzle. The tricky ground where dreams and reality blur is difficult to tame without waxing cliche, and make no mistake, Amy’s Choice treads over familiar pastiches. On top of that, the “arena” situation has been worked over in plenty of science fiction dramas, in which protagonists are forced by an omnipotent power to solve puzzles and fight for their lives. But Nye makes it all work by subordinating the material to the love triangle between the Doctor, Amy, and Rory, and to the final revelation of the Dream Lord’s identity. This climax is crucial to the story’s success, but for reasons that escape me has upset many viewers. The Dream Lord isn’t a rival or enemy of the Doctor (like the Master or Celestial Toymaker), but rather the personification of his darkest feelings and doubts, even his self-loathing (sort of like the Valeyard). His insults paint the Doctor as woefully insecure about being abandoned by Amy, call into question his motives for taking on a young companion, and skewer him for the callous manner in which he treats his friends. It doesn’t take the Doctor long to recognize his inner demon and hurl the contemptuous self-indictment: “I know who you are — there’s only one person in the universe who hates me as much as you do.” Brilliant. I don’t understand the clamor for a more traditionally Manichean foe; going that route would have trivialized if not killed the story. Nor do I understand the complaints about the psychic pollen, described by the Doctor as “a mind parasite which feeds on everything dark inside you, gives it a voice, and turns it against you”. (I love his flip answer to Amy, who demands to know why the pollen didn’t also feed on her and Rory. “Oh, the darkness inside you pair, it would have starved to death in an instant; I choose my friends with great care.”) Though of course, one follows the other: if one objects to the Boethian nature of the Dream Lord, the pollen must be condemned as well. But again, the fact that the true villain of the story is the Doctor’s shadow-self is what makes the story work. As for the secondary villains, the old pensioners work extremely well. That they are aliens underneath is classic Doctor Who, but they are quite menacing apart from this, even without the tongue-like protrusions which blast people to ash. 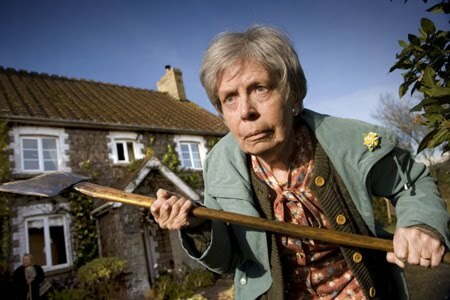 Watching the Doctor and Rory take on these decrepit old ladies is hilariously grand — surely only a viewer with a dull imagination (or, admittedly, a less perverse sense of humor than mine) could fail to be amused by the sight of feeble grandmas getting whacked by crowbars and thrown off the roofs of houses. That’s solid entertainment. The visuals are superb and work dynamically in contrast, as we shuffle back and forth between an idyllic countryside and a darkened TARDIS. The former exudes a wrong tone from the start, precisely because everything seems “too right”, and the latter becomes increasingly horrifying as our three heroes become covered in frost and barely able to speak or move — and is there even such thing as a “cold star”? Both scenarios are disturbing and off-kilter, and it’s hard to decide which could be real. Amy’s choice is, of course, ultimately a choice between two men: the fantasy hero from her childhood, and her less than impressive fiancee, who turns out to be the more impressive one after all. She sees the truth of this only when Rory is killed (in the Ledworth scenario), and, lashing out at the Doctor who is unable to save him, decides to kill herself in turn irrespective of whether or not she is dreaming. That the TARDIS scenario turns out to be a dream too is a nice twist that I didn’t see coming, and makes sense given that a Dream Lord wouldn’t logically have power over any reality. But it also suggests there was a never a “right” choice Amy had to make. Her preference for Rory is based entirely on how she feels in a certain moment. She confronts her devotion to two very different men in a particular now just as the Doctor must face his own demons. 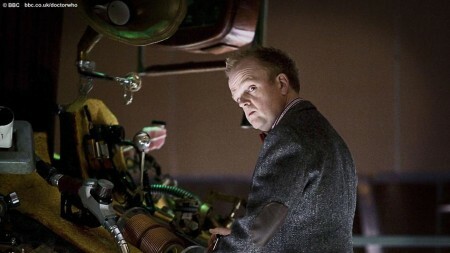 The story is ingeniously introspective, a welcome rarity in Doctor Who, and in my opinion a work of art. It’s worth mentioning the ongoing dialogue between Peter Jeffery and certain defenders of Morton Smith in the comments under my post from three weeks ago. Discussion finally seems to be winding down. What did the deutero-Paulinist mean by “a woman being saved through bearing children, if she continues in faith and love and holiness, with modesty” (I Tim 2:15)? Lynn Cohick, Women in the World of the Earliest Christians, pp 138-140, lists four possibilities without taking sides. (1) A woman will successfully endure the birthing process if she meets the stated conditions. (2) A pregnant/childbearing woman is delivered, not from death, but from the restriction against teaching and the use of abusive authority (I Tim 2:12). Alternatively, the woman is Mary, who as the counterpart to Eve, reversed the damage of the Fall by giving birth to the messiah; thus a pregnant/childbearing woman is delivered from the effects of Eve’s sin. In either case, the woman is delivered or released from certain constraints. (3) A childbearing woman has an assurance of spiritual salvation – a polemic against abstinence salvation which denigrated having children and other things related to the “material world”. (4) A childbearing woman has an assurance of spiritual salvation – an endorsement of Roman modesty codes, which demanded repercussions for adultery and promoted higher birthrates, in effect discouraging abortions. The pastoral letters are a bit outside my comfort zone. Anyone care to weigh in on the options?